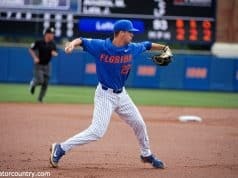 For the second year in a row the Florida Gators didn’t make it easy on themselves but for the second year in a row Michael Byrne recorded the 27th out and sent his team to the Super Regionals. Florida needed to come from behind but beat the FAU Owls 5-2 well after midnight on Monday, er, Tuesday morning. Florida turned to Jack Leftwich and the moment seemed to get the best of the freshman in the first inning. Leftwich walked two of the first three batters he faced with a strikeout in-between and then walked the bases loaded. A single scored two before Leftwich struck out two more. A weird inning with one hit, three walks and three strikeouts. 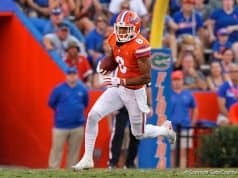 Nick Swan sat the Gators down in order in the first before Wil Dalton singled but Swan worked around a hit and a walk to keep Florida off the board. Leftwich settled in after the first, retiring the next eight he faced before a walk. His teammates picked him up with a run in the third inning when Jonathan India, who was selected fifth overall by the Cincinnati Reds earlier in the day, drove home Jonah Girand with a single. Florida finally took a lead, their first against FAU in 12 innings in the fourth inning. Brady Smith singled to start the frame. Nick Horvath followed with a single but Smith tried to go from first to third and was thrown out at third. 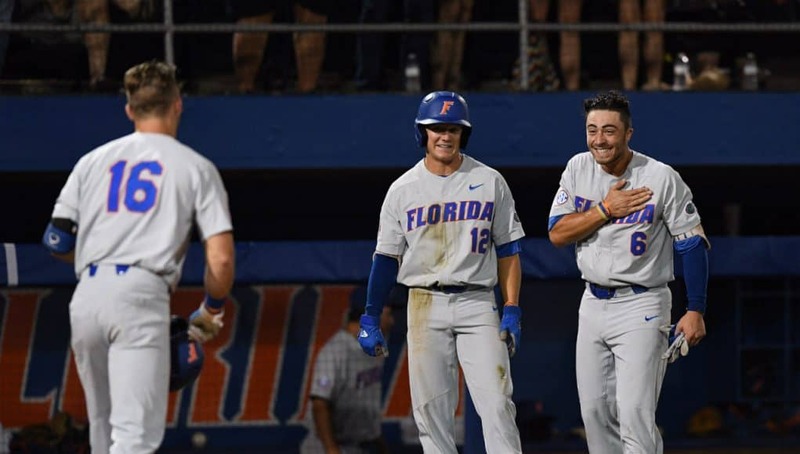 Girand launched a towering two run home run, his third of the regional to give Florida a 3-2 lead and the walk on admired his work with a little bat flip. The next inning Jonathan India launched his second home run of the regional, and 19th of the season, to left field to extend the lead to 4-2. 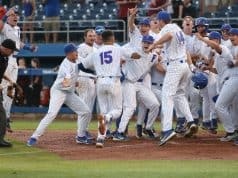 For the second time in the regional Wil Dalton followed India with a home run of his own, tying India atop the team lead with 19 home runs to give Florida a 5-2 advantage that they would hold on to. Tommy Mace relieved Leftwich, who struck out a career high eight batters. Mace threw two scoreless before handing it off to Byrne, who earned his 15th save of the season. The Gators will host Auburn in the Gainesville Super Regional. The dates for that will be announced on Tuesday morning.